On Tuesday night I had the distinct pleasure to attend the final performance of The St. Petersburg Opera's production of Puccini's Madama Butterfly. My pleasure was magnified by an order of magnitude because I was there with the great Ginny Powell. Ginny had never been to an opera before and it was an honor to introduce her to the art form. I met Ginny through Twitter about a year ago and last night was yet another testament to the power of that medium. The St. Pete Opera's staging of Madama Butterfly was spectacular. The Little Opera Company That Could hit another one out of the park last night and it's been a joy to watch them grow and prosper through their five seasons. That I live two blocks away from the theater where they perform just makes it all the more sweet. Giacomo Puccini's Madama Butterfly made its debut at La Scala in Milan in 1904, it's gone on to enter the Canon of the opera world and has been in continuous production since its premiere. Like all operas, it's a morality tale and it deals in archetypes. It never ceases to amaze me that that the human condition is the same as it ever was and grand operas prove that time and again. 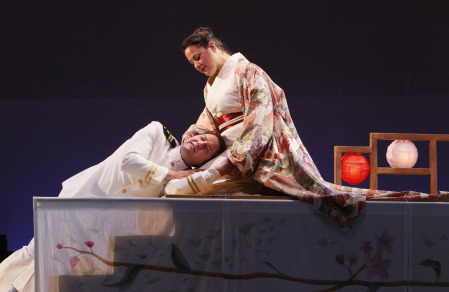 Madama Butterfly is an Italian opera set in Japan at the turn of the last century. Cio-Cio-San (aka Madama Butterfly) is a 15-year-old geisha who's sold in an arranged marriage to and American Naval Officer, Benjamin Franklin Pinkerton. Pinkerton goes back to sea shortly after their marriage and leaves Cio-Cio-San to raise their son with the help of her servant, Suzuki. Pinkerton promises to return before the "robins build their nests" but three years go by before he comes back to Nagasaki. When he finally returns, he has his new American wife in tow and they plan to take Cio-Cio-San's son to raise as their own. With nothing left to give and nothing left to lose, Cio-Cio-San kills herself in front of Pinkerton. It takes three hours and three acts to tell that story, but that's it in a nutshell. It's interesting that even in the early 1900s the US had an international image problem. It's interesting too that the story takes place in Nagasaki, a city the US all but wiped off the face of the earth in 1945.
io con sicura fede l'aspetto. I like it better in Italian. Hah! Matthew Edwardsen's Pinkerton was almost, but not quite, as amazing as Tillotson's Cio-Cio-San. His moral conflicts were as palpable as his fragile ego. Part of him wanted to be the man who has the world at his feet and part of him actually loved his Japanese child bride. It's easy to make him the bad guy but all of the characters in Madama Butterfly are products of the times when they lived. For all of the attention Un bel di vedremo gets, what always amazes me about Madama Butterfly is the segue between acts two and three. In Puccini's Italian, the piece is called Coro a bocca chiusa. In English, that means Chorus with mouths closed but it's better known as the Humming Chorus. It is one of the most hauntingly beautiful pieces of music ever composed. I'm really lucky to live in a community with an ironclad commitment to The Arts. I live in a small city yet we have two orchestras, and opera company and at least six professional theater companies. I can walk to any of our six performance spaces or our seven museums. In a state better know for its absurd politics and lap dances, I live in a cultural oasis. That's never a point lost on me. But our arts organizations are as threatened as anywhere else's. In a time when arts funding is under siege and when companies as prominent as the Philadelphia Orchestra file for bankruptcy, arts organizations everywhere need your support like never before. It's easy to pretend the arts are an indulgence for the intellectual set but it's through the arts that western civ passes from generation to generation. The arts, whether performing or visual, are what make us, us. They catalog and preserve our lives and our times, but more than that, they remind us of our place in the broad sweep of history. That I could see an opera the other night that premiered the year before my grandmother Stewart was born and that I could swoon and weep while hearing Un bel do vedremo the same way my great-great and great-grandparents would have connects me to them in ways nothing else can. That I can't look at a Mary Cassatt painting and not think of my sister Adele and that I can't see My Fair Lady and not think of my Dad are reason enough for me to know that the arts are important. Every time I hear Jeremiah Clarke's Trumpet Voluntary I see my Grandmother Anater. Every time I stand in front of a Degas or a Monet I wonder what my great-great-grandparents thought of Impressionism in its heyday. I live for the day to introduce my nieces and nephews to Hockney and Basquiat, Glass and Lindberg. Arts organizations everywhere need you support. Do yourself a favor and go to a performance or go to a museum. Make it a priority and keep it a priority. Arts organizations with no support go way and they don't come back once they're gone. Although Opera by far is not my "thing" but since I grew up so close to NYC (Long Island) it was definitely on my Bucket List. I saw "The Marriage of Figaro" with my Dad when I was about 16. Beautiful memory - glad I went. I have, over the last couple of years, introduced my husband and a couple of my friends to opera. It's been a great experience to see them realise that this is an art form that even "regular people" can and do enjoy. I saw Mme Butterfly last spring at the Vancouver Opera and it was just amazing. I cried so hard at the end (though, that turned out to be partly due to the fact that I was succumbing to H1N1 and didn't know it at the time...) What a tragic story though. I cried my way through the end of La Boheme too.. I am, deep down, a total softy.. but don't tell anyone. I'm pretty jealous that you have such a great resource so close to your house though. I'm going to have to come and visit Florida some day. DURING OPERA SEASON. Ah, Paul, when you’re right, you’re right, man. I can never listen to “Un bel di” dry-eyed. Gets me every time, right when the Soprano hits “the note.” I think it’s a combination of the beauty of the aria and the thought that a human voice can actually do such a thing. We CAN live without the arts, but then it’s no longer a life worth living. Puccini is my favourite opera composer -- thank you for the videos!